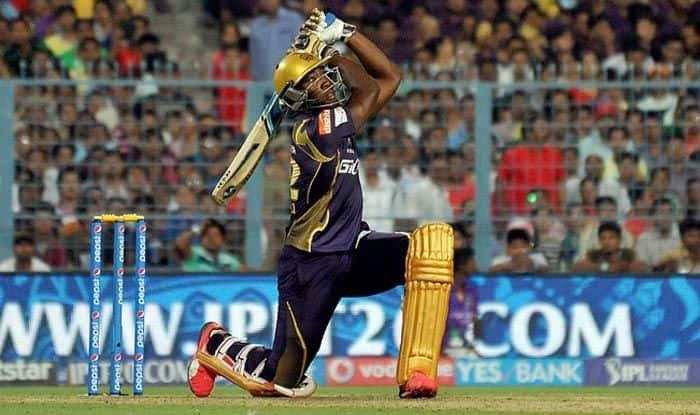 Andre Russell smashed an explosive 49 to spoil David Warner's scintillating comeback as Kolkata pulled off a dramatic six-wicket win over Hyderabad in the Indian T20 league. 19.51 IST: SIX! If Russell can hit, I can go big too! Gill gets into the act. Jumps out of his crease, gets to the pitch of the ball and thumps it over long on! 19.45 IST: FOUR! The over begins with a boundary! What a strike from Russell. A length ball, around off, Dre Rus swings it wide of mid on for a boundary! 19.35 IST: FOUR! Fine, fine shot! Goes with the spin and lofts it over covers. Ends the over well but it’s been a great spell from Rashid, 4-0-26-1! 19.30 IST: Welcome back after the break. In fact, we have not resumed. The light towers have still not come back to normal and the PLAYERS ARE WALKING OFF. All the lights have been turned off and are being switched back on. 19.18 IST: Floodlight failure. One of the light towers has stopped functioning. The umpires have sensibly signalled for the strategic break. Kolkata are probably finding themselves in troubled waters here. 64 needed from 28 balls but with Russell, Gill and Narine to come, they will back themselves. Hyderabad still have 2 overs of Bhuvneshwar after this and one over of Siddarth Kaul. They will back themselves too. 19.08 IST: FOUR! Short and outside off, cut through point for a boundary! 18.56 IST: FOUR! BANG! Full and down the leg side, Rana gets down and sweeps it behind square leg for a boundary! 18.33 IST: IN THE AIR AND DOWN! That is a shocker from Yusuf Pathan. The crowd likes it. Rashid gets Uthappa in the flight first ball. Never advisable to go after a bowler straightaway in his first over. Robin does that mistake and almost pays for it. Full and around middle, Uthappa looks to go big but mistimes it. He gets a massive top edge which goes nowhere except to Yusuf Pathan at long off. It is a simple catch but he takes it too easy. Does not even get his hands to the ball and it goes past his hands, hits his chest and drops down. A single taken. 18.25 IST: FOUR! Excellent bowling but what a terrific piece of batting. Good cricket all around. Uthappa comes down the track and Shakib fires it in the blockhole outside off. But the keeper-batsman adjusts well, converts it into a low full toss and drives it between cover and point! 18.04 IST: SIX! Ho ho ho! There goes Chris Lynn. Tossed up, around middle, Chris jumps out of the crease and launches this over long on! 175 more needed from 112 balls. 17.57 IST: The action is all set to resume. The Kolkata openers are out in the middle. Chris Lynn and Nitish Rana are at the crease. Lynn will take the strike. Bhuvneshwar Kumar will open the attack for the Orange Army! 17.35 IST: Vijay Shankar is adjudged LBW! But review taken. Looks to be going down leg. 17.28 IST: OUT! KNOCKED HIM OVER! Might be a blessing in disguise for Hyderabad. Yusuf Pathan is not a rapid starter and with the balls left in the innings, he needed to get going almost immediately, which he struggles to do. This is a slower delivery, beautifully disguised but Pathan does not pick it at all. 17.19 IST: Strategic break – Wicket just at the end there and the dangerous Warner is back in the hut. Kolkata will be hoping that this can put some brakes on the scoring and restrict Hyderabad under 190. Hyderabad meanwhile would be hoping that their big hitters can make full use of the platform set by Warner and take the score past the 200-run mark. Yusuf Pathan will bat after the break. 16.36 IST: The first strategic break of the match. Hyderabad are going along merrily but the bowling has not been great either. There is nothing in the pitch and the bowlers need to try and bowl consistent lines to at least stem the run flow. 16:15 IST: Warner is looking in sublime touch and in Bairstow, he may find a great partner. Two of the best batsmen in world cricket. It is a treat for fans at Eden. Kolkata has opted for a spin early in the innings in form of Piyush Chawla. 15:59 IST: The players are out in the pitch, David Warner and Jonny Bairstow will open proceedings for Hyderabad. 15.33 IST: TOSS – Kolkata have won the toss and opted to bowl first. 15:10 IST: A major injury concern for Sun Risers Hyderabad is that Kane Williamson is nursing a shoulder injury. Williamson will be a doubtful starter for Sunrisers Hyderabad’s opening IPL game against Kolkata Knight Riders, coach Tom Moody confirmed. 15:00 IST: Hello and a very warm welcome to the live cricket blog of the match between Kolkata and Hyderabad from the iconic Eden Garden in Kolkata. The match will start at 4 PM. Brief Preview: Comeback man David Warner would be the cynosure of all eyes when last year’s finalist Sunrisers Hyderabad open their campaign against two-time champions Kolkata Knight Riders in the 12th cash-rich Indian T20 league on Sunday. Under Warner’s captaincy, Sunrisers won their maiden IPL title in 2016 and in 2017 he was the leading run-getter for his team. But the Australian opener missed the last IPL because of last year’s infamous ball-tampering episode in Capetown, and is set make his comeback alongside Steve Smith. Warner will be the most scrutinised player for Sunrisers this season after he was banned for a year over his role in the ball-tampering scandal. While Warner and Smith were banned for a year, young Cameron Bancroft was left out for nine months for his role. And come this year, both Warner and Smith would be hoping to make an impact for their respective IPL sides. Sunrisers have traded in Vijay Shankar, Shahbaz Nadeem and Abhishek Sharma for Shikhar Dhawan, but it remains to be seen how they overcome the Indian opener’s departure. In KKR’s camp, skipper Dinesh Karthik will look to make most of the IPL opportunity to get the selectors’ attention. Taking charge of the team after Gautam Gambhir’s exit, Karthik led KKR to third place finish following their loss to SRH in the second eliminator last year.